Instant Pot Deviled Eggs with Bacon and Chives are an easy appetizer to prepare for parties or potlucks. The eggs are perfectly cooked and filled with a mixture of creamy egg yolks, crunchy bacon, pickles, onions, smooth mayonnaise, and tangy mustard. These deviled eggs are sure to please a crowd. Deviled eggs have probably been around since the dawn of time, and deviled eggs with bacon were probably close behind. I know we’ve been making deviled eggs for years. My son loves them and actually claims them as one of his favorite foods. Ok, so maybe deviled eggs haven’t been around since the dawn of time, but they have been around for a really long time. I was curious, so I did some research. The modern day deviled eggs that we know and love actually originated in Ancient Rome. How cool is that?! Even though the eggs weren’t prepared exactly the same way, they were boiled, filled with a spicy filling, and served as an appetizer of sorts. Sounds pretty similar to me! While deviled eggs as we know them make a great appetizer, they can be a bit time consuming. Boiling the water, waiting for the eggs to cook, letting the eggs cool, peeling the eggs, you get the picture. After I figured out how to make “boiled eggs” in the Instant Pot, deviled eggs were next on the list. Then naturally, deviled eggs with bacon followed. These were incredibly easy to make, and in all seriousness, I think it took the bacon longer to cook than the eggs. I even found a great way to peel the eggs that reduces mess and makes peeling a cinch! You may already know about it, but I’ve listed it in the tips below just in case. Don’t forget to check it out before you leave! Start by placing 1 cup of water into the Instant Pot and then add the trivet. We purchased a stackable trivet used specifically for eggs (I’ll leave the link below). Add 6 large eggs to the trivet, and close the lid. Turn the Instant Pot to high pressure (pressure cook/manual) for 5 minutes. Then allow a natural release for 5 minutes followed by a quick release. Remove the eggs from the Instant Pot, and place them into a bowl of ice water to stop the cooking process. After the eggs have cooled, remove the shells. Carefully, cut the eggs in half longways and remove the yolks. Place the yolks into a separate small bow. Add half the bacon, onions, pickles, mustard, salt, pepper, and mayonnaise to the yolks. Use a fork, potato masher, or food processor to mix the filling. Take a spoon or piping bag and place a bit of the filling into each of the halved egg whites. Garnish with the remaining bacon and chives. They make a great appetizer, snack, or the perfect addition to any potluck. You don’t have to babysit the eggs while they boil. The Instant Pot does all the work for you! They are simple to make! There’s no messy shells to deal with if you follow my tip below. Well, let’s be honest, there’s bacon! The Instant Pot method we used is similar to the 5-5-5 method (5 minutes for cooking, 5 minutes natural release, 5 minutes in an ice bath). Some Instant Pot users prefer the 6-6-6 or 7-7-7 method. Use whichever works best for YOU! Make peeling eggs easy by peeling them in a bowl of water. I like to use the same water as I used for the ice bath. Just hold the egg under water slightly to remove the shell. The shell comes off easier and sinks right to the bottom of the bowl! Plus, it doesn’t stick to your fingers. Add a spicy kick to these deviled eggs by adding hot sauce, jalapenos, or chiles. They are so versatile, you can change up the flavors to suit your tastes. For a smoother filling, leave out the bacon, and add it to the top after you’ve filled the eggs. I promised I’d leave a link to the stackable trivet we use for our boiled eggs. There’s a clickable image below. Just look for the eggs on the trivet! Need a tasty pressure cooker or Instant Pot dinner recipe? You may be interested in one of these! If you like this deviled eggs with bacon recipe, please leave us a comment and rate the recipe card. You can also find us on Facebook, Pinterest, Twitter and Instagram searching for Berly’s Kitchen! Place 1 cup of water into the Instant Pot. Add the trivet. Place eggs on the trivet, and close the lid. Set to high pressure (pressure cook/manual) for 5 minutes. Allow a natural release for 5 minutes followed by a quick release. Remove eggs and place in an ice bath. Peel the eggs, and cut in half longways. Carefully, remove the yolks. Place the yolks in a separate bowl, and add half the bacon, pickles, onions, mustard, salt, pepper, and mayonnaise. Mix until combined. Use a spoon or piping bag to fill each halved egg white with the yolk filling. Top with remaining bacon and chives. *Additional time of 30 minutes includes preparing bacon, approximate time it takes for Instant Pot to come to pressure, and additional time for eggs to cool, be peeled, and mixed. The total time from start to finish is approximately 40 minutes. 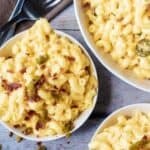 *We used a 6-quart Instant Pot for this recipe. Ok I definitely need an instant pot. I always fail at hard boiled eggs! And I looove a good deviled egg. Instant Pots are pretty amazing! They cook eggs perfectly every time. 🙂 Thanks, Ashley! I can’t think of a better combo than bacon and deviled eggs! Su ch a good snack food for easter whether brunch, lunch or dinner. Love that these are in the IP, too! So easy! I love my Instant Pot and kitchen gadgets in general and I have never seen these stackable trivets. SO COOL! I have got to buy them. What can’t that Instant Pot do right?! I love deviled eggs. At holiday events, I seek these little suckers out and, not gonna lie, usually eat more than my fair share. You sound just like my son! He also loves deviled eggs. They are an easy appetizer that tend to be a big hit. Thanks, Ben! Have a great day! This looks like a tasty use of hard boiled eggs! 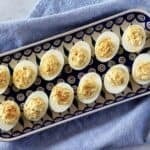 This is a great deviled egg recipe and I’m SO excited that I can make hard-boiled eggs in my pressure cooker! I’m going to give it a try on Saturday when I’m preparing my Easter deviled eggs. I make hard “boiled” eggs in my Instant Pot about once a week. Love the little egg trivet you have for yours! Deviled eggs are always a treat – these look fantastic! I still do not have an instapot, but it sounds like a great way to make hard boiled eggs! And these deviled eggs look delicious! I love that you can use the instant pot for pretty much everything! Deviled eggs are my fav too and you’ve really kicked them up a few notches by adding bacon…yum! Deviled eggs are also one of my husband’s favorite foods. He’d eat them literally every day if I’d make them that often! 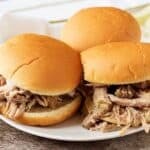 I never realized you could make them in an instant pot. I’ll definitely have to give this a try! Yummy! Deviled eggs are so tasty and I had no clue that you could do hard-boiled eggs in the instant pot! That machine is amazing!